The Plot Twist, who have been popping up around the capital for over a year, are back for the winter, with a one month 'Pasta 'n' Goulash' takeover of the Fairly Square cafe in Red Lion Street, Holborn, on Mondays to Fridays. Expect lots of goulash served in a crusty bread bowl and pasta specially whisked in a flaming wheel of Parmigiano Reggiano cheese, reflecting the founders Hungarian and Italian backgrounds, but also wines, craft beer, art, and live performances every Saturday night. Looking forward to this one! "The Plot Twist, a pop-up bar and kitchen showcasing an exciting fusion of Hungarian and Italian flavours, contemporary art and live music, launches a one month pop-up in Holborn on 23 November. The pop-up will be hosted at Fairly Square boasting two levels and will be open 6 days a week from Monday-Saturday. 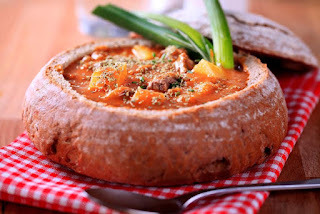 The seasonal menu will be focusing on Goulash and Pasta dishes, offering traditional Goulash Soup served in bread bowls, a less known but equally tasty Chicken paprikash with dumplings plus three different types of pasta dishes made in the Flaming Wheel of Parmigiano cheese. A fine selection of Hungarian and Italian charcuterie, cheese and pickles will favour those who would like to try the tastes of both countries mixed on one platter. A wide range of traditional wines from both countries will be available by the glass as well as more than 10 award winning craft beers from Hungary. The drinks list will also feature different varieties of delicious & warming Hungarian fruit brandy, Pálinka. The Plot Twist will also feature a colourful calendar throughout their one-month pop-up: a weekly rotation of art exhibitions by London-based artists, a Hungarian-Italian supper club with wine pairing on Wednesdays, a craft beer tasting for beginners with dinner and live music performances on every Saturday evening. Couple and partners in business, Agata Reverberi and Tamas Sapi (founders of The Plot Twist, originally from Parma and Budapest) met in London and fell in love at the first sight. From that moment they decided to share life together and right after an inspiring vacation in the Hungarian capital to create their first start-up too. Their aim is to show London how the two cuisines are fitting together, creating a never-seen fusion and spice it up with contemporary art and live music. In September 2016, Agata and Tamas teamed up with Italian chefs and founders of The Cuoppo, Francesco Spagnuolo and Salvatore Vezzi, originally from Naples. The team organised two successful food events in Bethnal Green before the opening of their very first pop-up bar and kitchen in Holborn."